This exquisite rendition created originally by the artist captures the outstanding champion, " I wanted to capture not only the features of this great thoroughbred along with a race scene of capturing another victory. I also included in the backdrop of the American Flag which symbolizes our national pride of this athlete"
Limited Edition lithographs of this special work by Delgado are now available. Only 250 pieces are to be made available measuring 11" x 17" printed in full color on acid free stock. Each comes with a signed certificate of authenticity. 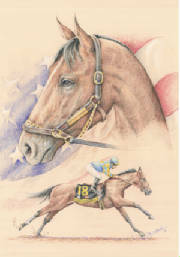 This is truly any horse racing lover collector's work they will be proud to own and display. Capturing the 2015 Kentucky Derby! Incudes professional wooden molding, matting, glass and wire attached.